Since you are in NY look up Tefco! We (our raw food co-op) hire a truck to bring our food from NY. Jerry Briffa from Tefco. The number is posted, can you see it? I have been feeding my Zac Nutro Puppy for large breeds. I had heard good things about Nutro dog food. And now when I search I'm reading alot of bad things. Has anyone had any problems with this brand? How funny, I just found Raise a Paw for Raw last night but just skimmed through. I will look into it thanks. Thanks Rebecca I will check out that group tonight. I have tried the tripe in the can before. Opening day here for deer is the week before Thanksgiving so now my husband will really be on a mission. Sassy... Nutro overall is not a bad food, but their overwhelming amount of recalls (some within the past month) coupled with questionable ingredients makes them a food that I will never recommend. Nutro uses a synthetic form of vitamin K... it's referred to as menadione, menadione sodium bisulfite, menadion bisulfite, or something similar. Rather than type it all up myself...Here is a quick copy and paste from The Dog Food Project in reference to Menadione. One of the more obscure ingredients found in many pet foods are menadione derivatives - in the form of menadione sodium bisulfate, menadione sodium bisulfite, menadione dimethylprimidinol sulfate, menadione dimethylprimidinol sulfite or menadione dimethylpyrimidinol bisulfite, often listed as "a source of vitamin K activity" or "vitamin K supplement". Unless otherwise noted, these compounds are summarily referred to as "menadione" in this article to make it easier to read. Some manufacturers leave out the "menadione" part of the above chemical names in their ingredient lists (e.g. you see only "dimethylprimidinol sulfate" listed instead of "menadione dimethylprimidinol sulfate"), and menadione does not only occur in dry and canned foods, but edible chew toys, supplements and treats as well. Thoroughly research any item with an ingredient list that claims a "source of vitamin K", "source of vitamin K activity" or "vitamin K" in parentheses and contact the manufacturer if you have any questions. Menadione, also known as vitamin K3, is a synthetic version of vitamin K. The natural occuring compounds are vitamin K1 (Phylloquinone, from plant sources) and Vitamin K2 (Menaquinone, synthesized by bacteria in the digestive tract and absorbed by the body). Technically menadione isn't even a vitamin, but a precursor that is converted in the body after ingestion. Natural vitamin K is fat soluble, while menadione derivatives (pure menadione can not be processed) are water soluble and bypass the natural pathway of utilization by the body. As a non-native speaker (German is my native language), it has been difficult for me to compose this article in English, since I had to translate most of my information from literature originally written in German. My search for relevant, unbiased sources in English was not very successful, with exception of some obscure references and texts that provided some information but do not include all the facts. There were also many articles written by authors who didn't even have the basic knowledge to differentiate between vtiamin K1, K2 and K3. Yesterday, I gave the dogs their first raw feeding. I was so surprised how well they did. I started out with chicken necks and backs. At first my husband and I held it for the dogs because Diesel just wanted to inhale it. My Miss Prissy boxer ate it like a lady. Diesel did a few chomps but then just swallowed it. I am hoping eventually he will know he can take his time and chew it slowly. I am amazed at how satisfied Diesel looked after eating, I swear he has not looked that way ever. So far so good no vomiting or diaharria. Is it possible it can still happen after 24 hours? Chicken quarters are on sale for .39lb so off to the store. I have been feeding Diesel in his crate since we have began his raw diet and was just wondering if you think this could somehow start a resource guarding issue. When he was fed kibble he was in the kitchen with kids bumping into him, things dropping on the floor next to him etc. Should I practice taking away his dish of food as I did to him in the past with his kibble? is it just for hygiene reasons? I don't know why it would. are you feeding 2x day? Maybe breakfast in the kitchen/dinner in crate? mine did growl at me once and I was so shocked! I screamed WTH!!! and smacked his mouth before I even new what happened-that scared him-now I can take half eaten food from his mouth -with my teeth if I wanted! I feed outside because I can't stand the idea of having those germs in the crate. I'd never feel like I got it clean enough, but I'm a freak about stuff like that. Reyna did start a little bit of resource guarding even outside, but I nipped that in the bud. She now has to wait for her food. She's put in a sit and told to wait, and I lay it down infront of her and when she makes eye contact with me and is no longer fixated on her meal, I release her to eat. It was the simplest change in our feeding regimen, but it worked wonders with her. If you're worried about it, do little things to make him work for his meals and earn them as a reward, not an entitlement. Thanks Bridget and Rebecca. He has always worked for his food and still does. I have just never seen him love it so much. Hi guys,sorry for being such a pain in the a$$ I just wanna do this the right way. We will be coming up on a week of chicken and all is well. What do you suggest my next protein be? I still should hold off on organs for a while right? My dog is not a pork eater but, I would go with some pork necks. If I get beef ribs- I like to add ground beef. Wait a few more weeks before you go with lamb. It wouldn't hurt for a slice of liver-next week. Keep it in smaller quantities-if he gets bound or dry poopies-give another slice of liver. Beef next would be fine. I know a lot of people whose dogs struggle with pork, so I'd wait on that. And I'm leary of the necks because Bam has puked them back up in HUGE chunks before. They are easy to swallow without chewing, but too hard for him to digest. I'm with Bridget in that you could probably start adding a teensy bit of liver in if you want. If you want to do pork, I've found that shoulders are the cheapest, and make for a good meaty, boneless meal. It's really up to you!!! I'm not an expert on this, though. PS - We feed one raw meal a week (typically a whole raw chicken) skipping a meal before and a meal after; will try to get that up to 3-5 raw meals a week by Thanksgiving. We will have about 40lbs of tongue/heart/liver sausage for Duke in about a week; possibly some tripe, gullet and trachea, too. :shrug: The freezer just got delivered from NFM on Tuesday, so, we'll be on the lookout for cheap chicken, too. Pork is fine, it's just that some dogs don't do well on it. My two do fine on it and love it--even Bam-Bam whose stomach could never handle a single kibble can tolerate pork. It's typically one of those meats that you want to introduce to an experienced raw stomach, not to a dog that is newly on raw. Diesel loves Venison. I put a small amount of liver in his bowl as well. Do you feed whole chickens to the dogs? I bought a whole chicken and wondered if I could give him the whole chicken with insides and all or should I cut it up? The chicken is only about 3 pounds. I think Pork will be my next protein. It's probably the most economical. He chews it and flips it around until he's mashed the entire carcass up into a big gooey crushed mess, and then he swallows it. LOL ~That is what Tug does! I thought he did that cuz he wanted the expensive "boneless" chicken! If I ever have to pick it up, it is just mushy and gross. Has anyone tried authority large breed puppy food? Petsmart has it and the price is very cheap like $26 for a 30 lb bag. After tons of research, I landed on Fromm. Family-owned business in Wisconsin and they make their own food. My two absolutely love it. Nice to see you here! We have been delighted with the results on Fromm. We use the Gold Adult. Took us some time to find a place to special order it for us but it is so worth the effort. Always smells fresh. Haven't tried Authority but have noticed they greatly improved their formulas recently. I just joined about a week ago. I have been visiting this site for almost 2 years. 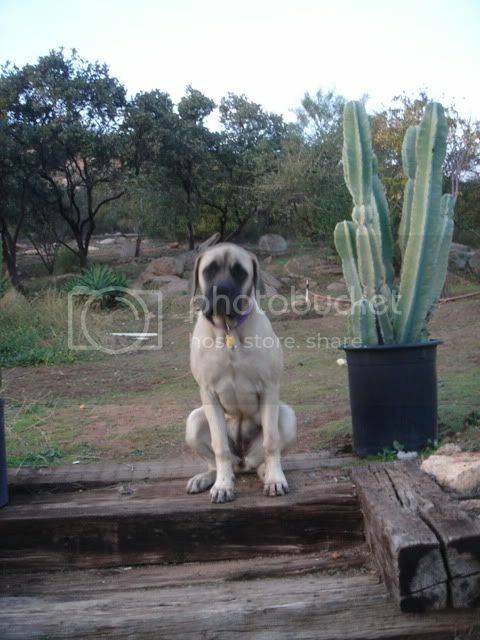 We got our fist English Mastiff in March of 2007. His name is Rocky and is our first house dog. What a big addition. My husband is still is shaking his head. Our youngest of 4 kids is 13 so Rocky is the new baby of the house. I have really enjoyed reading all of the advice and good ideas on this site. I kind of went about joining backwards. I left a post last week on the Health Issue vein and hadn't had any response so I thought I should introduce myself first here. I need any advice or suggestions that anyone can give me. I noticed about 3 weeks ago Rocky ran up to the car when I pulled in and he was baby stepping with his front feet. Short choppy steps. Thought maybe he had a sore foot but couldn't really see or feel anything, so we decided to keep any eye on it and just see. Well the next weekend he unexpectedly fell twice. That did it! I scheduled an appt with our vet and he thinks it might be Wobblers Disease. He's been on a steriod for 10 days and then the vet said we need to keep him from running or being to active, indefinately. 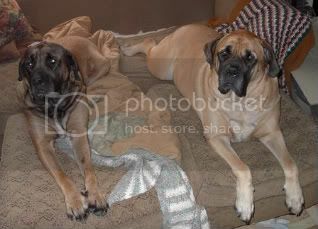 Has anyone else had this problem with their mastiffs. I would appreciate any help!!! Hi everyone, new here and have my first mastiff. She is currently just shy of 8 months, and close to 100 pounds. I have a couple questions about food, as I recently had to change it. First Question- does anyone else feed their dogs fruits and veggies? Mine will eat anything from asparagus, to lettuce, to bananas, to apples, to carrots... pretty much anything I put in front of her. Anybody else like this? Also, I've noticed that most people on here feed raw, which is something I am working towards, currently mixing. So, I have heard over and over again not to give dogs bones, yet almost everything I have read says "whole chickens" or "chicken necks" or a part of chicken that has bones. I'm confused now, yes or no to bones? Second Question- How much do you guys normally feed your dogs at this age or weight? When I first got her I asked the breeder how much her dad ate and she said about 4-5 cups a day. I don't believe her as my pooch is on 10+ cups a day. I think she must have a fast metabolism or something... she's already been to the vets (and de-wormed) and the vet said everything was fine and that she's at a good weight/ body condition. Plus she is highly active, we live on a 40 acre ranch and she's my hiking buddy. Do I need to worry about bloat at her age with feeding like this? The only downfall is that it is SO expensive. I lost my job about almost two months ago and HAD to switch her to a cheaper food. ( Did NOT want to ). After some research (and sale prices) I settled on Canidae. However, Canidae doesn't have a large breed formula. I did a lot of researching between the two, and the only real difference I can see is just the percent of protein and fat. Canidae has slightly more of each, only about 2% or so. And it has more calories per cup. She's been on it a week now and seems fine, slightly softer stools, but otherwise fine. And she likes it. Just because I'm a worry wart, I'd like others opinions on this food, and if she should be fine on this "all lifestage" food. I don't want to risk anything. Or if there is something else that I should be looking for... I watch her like a hawk but have heard so many horror stories- I don't want to do anything wrong. PS. Dieselboy, your dog is gorgeous! (I wanted everyone to see her body condition). Hi Cari, Welcome. I am by no means as experienced as some of the others here but I will tell you what I know and learned. No need for veggies in a dogs diet. Even though ever now and then I use apples and carrots as treat when working with Diesel. Remember no seeds of the apples. Food is a hot topic and everybody has an opinion. Diesel was on a high quality kibble and we switch to other high quality kibbles and it didn't work for him. He always had very loose stools and was pooping at least 4x a day. I switched to raw and have had wonderful results. His poops are perfect and he goes at the most 2x a day. COOKED BONES not good. Diesel will eat a whole raw chicken out of the fridge as a meal. There is a yahoo raw group you can google. I am sure that you will get good advice on the amount of kibble that you should be feeding. Diesel eats 6 lbs of food a day,weighs 130lbs and still is a lean, lanky, dopey pup. Good luck!!! I just ordered some tripe. How much do you think I should start Diesel off with? Do you feed it as a meal or just add it with some other stuff? I feed a homemade mix in the morning made of beef, liver(beef or chicken, sometimes chicken gizzards or hearts instead), barley, yam, pumpkin, potato, carrots, green beans and lettuce. For dinner my troop gets raw chicken. They chew on raw beef bones throughout the day which beats them chewing on my shoes and furniture. I have been feeding this way for about 10 years and my oldest just turned 11 in December. I think the "All Life Stages" is ok. Cole (on this board) is really shiny and healthy and I think Mary fed or used to feed him that. My dog is raw fed and because he had a bowel obstruction in the past. I like to give him lentils at least 2 times a week. It is very high in fiber and also high protien. I also give him a couple of cans of mackeral each week. I found my male at a house several days after he was abandoned without food or water in the hot sun. I have 2 puppies to him. We have fed many differant brands of dogfood trying to figure out what works and what doesn't. We tried Iams,differant feed mill brands and they made them very sick. Hair was falling out and they lost 10-15# in 2 days. We tried Nutro but it was too rich. We have been feeding them Purina kibbles and bits and they do very well on it and they love it. The male puppy has out grown the dad by 40#. He's 235# @ 18mos. I give mine 2lbs at a time. I also like to give him green tripe 2 times a week. If I were more diligent and had more time, he would get about a 1/2 to 1 lb a day. I can only seem to defrost 1 x a week and the stink prevents me from going right back in the freezer to do it again! How did Deisal LOVE it? does he need time to warm up or is he all over it? The person that runs our local raw food co-op calls it the perfect food. I know they gain weight fast when they get it real often too. So if you got a chubby, keep that in mind. I have heard that feeding sardines occasionally was good for a dogs coat. Is this true or is this a no no? I feed raw (prey model) and just wanted to chime in with what I do for feeding time. I went to the feed store and bought these large rubber feed pans (like a foot and a half in diameter but short sides), they were cheap like 5-6 bucks each. I put them out in the yard and that is where the dogs eat out of. It keeps me from having to mop every day, and the dogs have a central place to keep their food while they munch what ever they are working on. It is also easy to clean. They run to their spots and wait while we pass out food, its funny to see. Mine eat most anything, though I do have to hide liver in ground beef to get my boy to touch it. He will literally wretch like a child and spit it on the ground, funny but annoying. What is the best food for my Masitffs? I started off with Proplan but then switched to Purina One for large breeds because my breeder told me this was the best one for mastiffs. Hi Everyone, I love that I found this forum, there is sooo much information. From what I have been reading it seems like the way to go would be the Eagle Pack dog food but at this time I wouldn't be able to afford it. We have only had our 3 yr old for 6 months and until yesterday she was doing fine on her food. Her previous owners were feeding her Purina Adult formula. Since we are new to the dog community we didn't realize how bad this food is for Bella and since she seemed to like her food we didn't want to change it. She has always been very regular and doesn't seem to have the loose stools, allergy problems, etc that other people have mentioned. On Monday she went to the bathroom 3x like normal and then Tuesday she couldn't go at all. It was so sad to see her continuously squatting and straining in new spots. In the evening I made her homemade treats with peanut butter,oatmeal,carrots, and oil to see if that would help. I also put a few teaspoons of benefiber in her water. By morning she still hadn't gone and we started to be very concerned that there was something major wrong. I immediately called the vet and she informed me that as long as she didn't throw up to wait another day. She finally went later that morning but still doesn't seem quite right. 1. Where can I find reputable information if I choose to make her food. I'm not sure what ingredients are key, how much food she would need at each serving, etc. 2. Is there a website or book where I can find this info. They will pass comfortably and completely. there is no right or wrong food-it is what works for your dog and you. If you have a Costco-they have Kirkland Lamb and Rice formula it is reasonably priced and a quality food by allot of accounts on this forum. Thanks so much for the info. I'm definitely going to pick up a can of pumpkin and check out Costco! I got Rocky a turkey neck today! Well, three of them! We want to try and incorporate more raw into his diet. Should I feed him one everyday or wait a few days? I feed my puppy Solid Gold Wolf Cub. My puppy loves it and has very little gas! which is great for me because when I was changing from purina one to solid gold his gas could peel paint off a wall lol. Does anyone else feed their dog this food? Also how long should I be feeding my puppy, puppy food before changing to adult food? It was suggested that I throw it in the pond for chum! At Big Dog Natural we strongly believe that the nutrition provided to your dog has a great effect on overall welfare. Poor diet can lead to numerous health problems. In our natural dog foods, all ingredients are processed without being cooked first (except for the egg whites in our Supreme Complete, which are cooked to neutralize the protein Avidin, which inactivates Biotin. Biotin is an essential vitamin needed by your dog). We keep Big Dog Natural dog foods raw because after raw materials are heated, enzymes are killed, vitamins are neutralized and fats become saturated. Proteins and fats come from fresh chicken and beef meat. Fresh meat is the ideal source to obtain the ideal amino-acid pattern. An adult dog needs 10 essential amino acids, a growing dog needs two more, Arginine and Histibine, which brings it to 12 needed essential amino acids. In nature, or in natural dog food such as Big Dog Natural, this is not a problem, because fresh meat contains all amino acids in the right proportion. The unsaturated fat, especially from poultry, produces unsaturated essential fatty acids, needed by your dog. We complete these with raw egg yolks, sunflower oil, coconut oil, cod liver oil, salmon oil and flax seed. These are excellent sources of Omega 3. In order to maintain a high quality, Big Dog Natural freezes its raw materials immediately after preparation (before using it for production). During production, our products remain frozen all the time. This total approach guarantees that Big Dog Natural contains enzymes, natural vitamins, minerals and micronutrients in a most optimal form and also guarantees that the product’s natural juices don’t get wasted. Natural meat juices provide the most digestible iron, but also make the intake of huge quantities of water superfluous. Drinking too much dilutes the gastric acid, and this does not benefit digestion. One of the main advantages of frozen dog food, like Big Dog Natural, is that you don’t need any preservatives or antioxidants. There is no need for high doses of vitamins to prevent the fat from becoming rancid since the egg yolk, the sunflower oil and the blueberry in Big Dog Natural provide these natural preservatives and antioxidants in excellent amounts already. Give your dog a natural snack (like a bully stick, a bone, etc…) immediately after his meal. When chewing a natural snack your dog develops enzymes which digest his food even better. This also extends the time the dog is busy with food in a natural way. • Supreme Complete is a complete and balanced dog food. You don’t have to add anything and suits every life stage of your dog. Small and large, young and old can eat the same food. • Supreme Complete will assure you that your dog will like his food, which is one of the main requirements of a dog food. The smell, quality and taste of fresh meat are irreplaceable and not comparable with kibble. After all, your dog is a meat eater by nature. • Supreme Complete is packed in handy, leak free, 2 lbs chubs. This enables you to easily cut off the right amount you need. Defrost in the refrigerator. • Supreme Complete does not contain offal, but only poultry and meat that come from USDA inspected plants. Our eggs, vegetables and fruits come from local farmers. These are, as are our oils, human grade. • Supreme Complete does not contain any grains, preservatives, coloring agents or taste enhancers. This reduces a lot of visits to your vet since in traditional commercial dog food, these products are responsible for stomach and intestinal problems, allergies, skin problems and behavioral problems. • Supreme Complete reduces the risks of bloat (torsion of the stomach). • Supreme Complete reduces the production of tooth plaque. • Supreme Complete guarantees solid and compact feces. • Supreme Complete eliminates the need of excess water consumption. • Whole chicken: We use whole chicken to have the full advantage of the superior source of essential amino acids that comes from chicken meat. We also want to have full benefit of the unsaturated essential fatty acids you find in whole chicken, so much needed by your dog. mentioned earlier, it’s good to give your dog a natural snack immediately after his meal (like a bully stick, a bone, etc…). improved appetite, better digestion, better coat, and so much more. Green tripe is a MUST in every dog meal. • Chicken organ meat: Organ meat is a must to complete the essential amino acids and is an excellent source of natural vitamins and minerals. • Whole egg: Superb source of essential amino acids, fatty acids and natural vitamins and minerals. We separate the egg whites from the yolks and cook the egg whites. Raw egg white contains Avidin, a protein that binds with biotin and immobilizes it. Biotin is necessary for cell growth, the production of fatty acids, and the metabolism of fats and amino acids. Cooking the egg whites naturalizes the Avidin and protects the Biotin from being immobilized. • Sweet potato: a good source of Vitamin A, Vitamin B6, Potassium and Manganese, and also a good source of Dietary Fiber. • Broccoli: a good source of Protein, Vitamin E (Alpha Tocopherol), Thiamin, Riboflavin, Pantothenic Acid, Calcium, Iron, Magnesium, Phosphorus and Selenium, and a very good source of Dietary Fiber, Vitamin A, Vitamin C, Vitamin K, Vitamin B6, Folate, Potassium and Manganese. • Carrot: a good source of Thiamin, Niacin, Vitamin B6, Folate and Manganese, and a very good source of Dietary Fiber, Vitamin A, Vitamin C, Vitamin K and Potassium. • Squash: a good source of Dietary Fiber, Vitamin E (Alpha Tocopherol), Thiamin, Niacin, Vitamin B6, Folate, Calcium and Magnesium, and a very good source of Vitamin A, Vitamin C, Potassium and Manganese. • Parsley: a good source of Protein, Vitamin E (Alpha Tocopherol), Thiamin, Riboflavin, Niacin, Vitamin B6, Pantothenic Acid, Phosphorus and Zinc, and a very good source of Dietary Fiber, Vitamin A, Vitamin C, Vitamin K, Folate, Calcium, Iron, Magnesium, Potassium, Copper and Manganese. • Spinach: a good source of Niacin and Zinc, and a very good source of Dietary Fiber, Protein, Vitamin A, Vitamin C, Vitamin E (Alpha Tocopherol), Vitamin K, Thiamin, Riboflavin, Vitamin B6, Folate, Calcium, Iron, Magnesium, Phosphorus, Potassium, Copper and Manganese. • Apple: an alkaline food, rich in vitamins A, B, and C, calcium, fiber and pectin. Pectin binds glucose to help regulate insulin. Pectin also binds minerals such as iron and copper, to prevent toxic buildup in the body. The pits are removed since these are toxic. • Blueberry: a good source of Dietary Fiber, and a very good source of Vitamin C, Vitamin K and Manganese. Excellent anti-oxidant. body. It stimulates calcium uptake in youngsters, and helps detoxify the blood. This is a wonderful product for your dog, for many, many reasons. • Flax seed: the benefits of flax seeds are numerous and include constipation relief, they assist in building muscle and burning fat. Flax seeds are high in Omega 3 oils, which are not produced by the body self. to the presence of lauric acid, capric acid and caprylic acid, and its properties such as antimicrobial, antioxidant, antifungal, antibacterial, soothing, etc. • High Oleic Sunflower Oil: is high in vitamin E and low in saturated fat. High oleic sunflower oils are classified as having monounsaturated levels of 80% and above. carefully. On the other hand, Vitamin D is not commonly found in natural foods, and is necessary for the body to process calcium and is therefore a factor in preventing osteoporosis and maintaining bone health. dogs, both old and young. Perhaps, most important, Salmon oil contains Omega 3 oil too, which decreases the risk of heart disease. excellent source of naturally chelated macro and micro minerals. It is essential for growing puppies, reproducing animals and for all other dogs. is eating. In Supreme Complete we made sure we used ingredients to cover all this. However, there are certain circumstances in which a dog might need some supplements. In order to ensure your dog receives all he needs in his diet, we added some minerals which are not readily available in natural foods. To achieve this, we have included some Mineral Proteinates. Mineral Proteinates are minerals which bind to small proteins (peptides) oramino acids. When Zinc or Copper are bound to proteins to form Zinc Proteinate or Copper Proteinate, they take on the biochemical characteristics of the particular peptide to which they are bound. Since peptides are readily absorbed into the dog’s body during digestion, this characteristic makes Mineral Proteinates more available to your dog. We, at Big Dog Natural, can look back on 30 years of experience in the dog world; in rescue, board member of breed clubs, dog show exhibitors, breeders, dog trainers, dog groomer, manager of a boarding kennel and a pet supply store, dog food manufacturer, but most important, as owners of the most adorable, loveable and loyal species in the world, our dogs. Big Dog Natural brings you a high quality dog food for a low, affordable price… because we not only love to see our own dogs healthy and happy, we also want you to be happy and experience the same feeling we had in the last 30 years, a healthy and happy dog. We love dogs… you and your dog will love Big Dog Natural. I have an interest in BDN but I live in GA and my Baby is still a puppy. SO as of now I am trying to make decisions. Currently Baby is eating BilJac. I am not satisfied. I ahve started doing research and PMI Nutrition Exclusive Large Breed is looking interesting. I also have an interest in Blue Longevity. Does anyone have any reviews or opinions on either of these foods? Innova was the one I originally planned to use but the new purchase of the company has changed that idea. 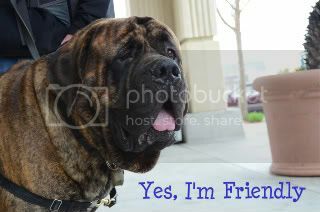 I have been having issues finding a good food for my Mastiff. He was on Euk Large Breed Puppy when I got him which is what the breeder was feeding him. Within 2 weeks of getting him he developed rapid growth syndrome and I had to change his food to Natural Balance Sweet Potato and Fish. His poops were never very solid on this food and as the weeks went on they would get softer and softer. I did a slow food change to Natural Balance Chicken and Sweet Potato.. horrible gas and vomiting. I am now cooking ground turkey and rice for him 3 times a day.. no vomiting, no runs, and no gas. I have to stay on a food that has 22% or less protein and 12% or less fat. I am going to slowly try to introduce the Natural Balance Vegetarian Diet with is ground chicken. Has anyone tried this food with their Mastiff's? I am hoping his allergy is to Sweet Potato's and or salmon oil since those are the only 2 ingredients that are the same in the first 2 foods. Looking for any thoughts or suggestions. Are there other foods out there with low protein and fat besides Natural Balance? I can't seem to find any that are in the range I need. Thanks!! We have made the switch from Holistic Select to Precise Large and Giant Breed Puppy Formula. We were between Precise and Fromm's, but we have chosen Precise for now. My dog is now almost 13 months old. Anyone have an opinion of when to put him on the adult formula as opposed to puppy formula?